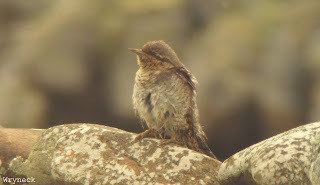 A much busier day with the highlights being a goosander on Bewan Loch and a wryneck at Seaside. Wheatears totalled 113, 3 grey heron were at the north end , 2 white wagtail along the west side and 2 carrion crow flew north. Warblers consisted 5 willow warbler, 2 blackcap, 7 chiffchaff and a goldcrest was in Holland. 4 whimbrel were noted, 5 long-tailed ducks were in Linklet Bay and finches seen included a chaffinch, brambling and 4 siskin. Other sightings included 2 fieldfare, and reasonable counts of 34 sandwich terns, 186 purple sandpiper and 424 turnstone. Three new birds for the year today included a house martin at the Obs, arctic tern in Linklet Bay and a lesser whitethroat at Kersitter. A black-tailed godwit was at Kirbest Mire, 30 dunlin were on the Links and a carrion crow at Lurand. Elsewhere were a goldcrest, blackcap, woodpigeon and 4 chiffchaff. Very limited coverage today but at Holland in the morning were a kestrel, a collared dove, 4 chiffchaff and a willow warbler. 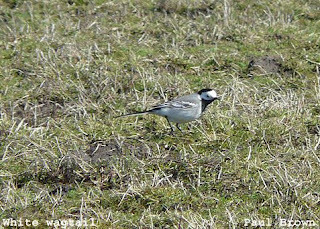 A mealy redpoll was by the Observatory where 3 white wagtails were in the newly ploughed fields, the 2 avocets still on Trolla Vatn Loch and at Sangar a flava wagtail was seen. A greenshank on Garso Loch is the first of the year, a siskin was at the Surgery and mealy redpolls were at the Observatory and Bury. 4 chiffchaff, 2 blackcap and a sparrowhawk were at Holland and singles of white wagtail and whimbrel were seen. A redwing and song thrush were at Lurand and 15 fieldfare at Peckhole, single white wagtails were at Lindswick and Twingness. 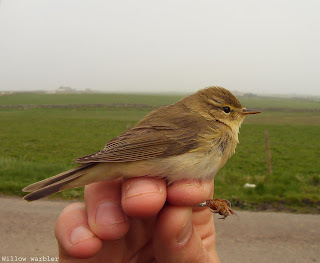 A chiffchaff was at Holland, 7 swallow at Brides'ness and a sand martin over Gretchen Loch. 4 snow bunting were at Tor Ness, a sparrowhawk was seen by the Observatory and 2 whimbrel were at West Beach. The 2 avocet remain on Trolla Vatn Loch, and also at the north end were 8 hooded crow and a carrion crow. 4 brambling and a woodpigeon were at Kirbest and 2 rook flew over, and nearby at Holland were a sparrowhawk and a collared dove. 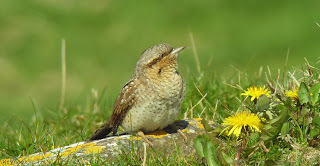 A wryneck was seen at by Brides Loch, a chaffinch and the only chiffchaff were at the Observatory and a party of 4 black-throated diver were in Linklet Bay. Very little today really with the best being a 2nd winter iceland gull in Nouster Bay. A rook, 2 chiffchaff and a chaffinch were at the Observatory, 2 sand martins were at Holland and an arctic skua flew through. Presumably the same 2 avocet visited again today, this time on Trolla Vatn Loch. A count of 56 wheatears were mostly confined towards the north end, a willow warbler was at Rue and a goldcrest at Ystang. 2 whimbrel flew south in the afternoon and a siskin and a chaffinch were at the Observatory. A long-eared owl was in Holland gardens early morning and a few swallows passed through today with 13 in total, plus 2 sand martins. A rook and carrion crow went out and 5 sandwich terns were in Nouster Bay. Just 3 chiffchaff and 5 wheatear were seen. 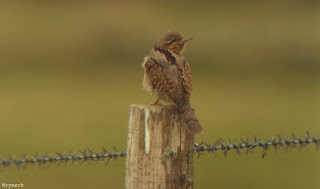 The second wryneck so far this April was at greenwall, a willow warbler was at Brecken and at Brides Loch were 4 swallows and the first whimbrel. 2 more swallows were at the north end, a total of 4 chiffchaff and 2 blackcap were seen and wheatears continue to increase with 52. 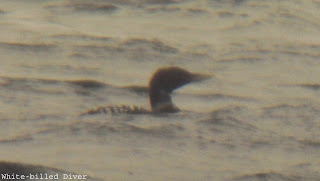 The biggest event of the day, aided by rare flat-calm conditions, was of a record breaking 132 great northern divers, with the vast majority off Twingness. 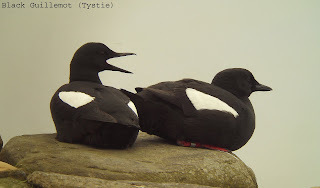 The annual black guillemot count took place this morning, with a total of 549 birds. 8 grey heron were on the shore between Westness and Sennes, wheatears had increased with 34 and also seen were a swallow, 2 chiffchaff and 5 lesser-black backed gulls. 2 woodpigeon and a collared dove were at Kirbest, 2 goldcrest in Holland gardens and thrushes consisted of a fieldfare, a song thrush and 2 redwing. Other migrants included 2 blackcap, 4 chiffchaff, a robin and a sparrowhawk. At Westness were a rook, woodpigeon and 3 grey heron, 2 goldcrest and a blackcap at the Observatory and another blackcap, goldcrest and song thrush at Holland. At least 1 collared dove was present and 18 wheatears were logged. A wryneck near the Surgery this morning continues this springs theme of early records, and nearby at the shop and Holland were a willow warbler, a blackcap and 4 goldcrest. An adult white-billed diver was seen close in from Dennis Head, and nearby migrants included a robin, black redstart and a brambling. 6 chffchaffs were scattered around the island and 2 woodpigeon were by Kirbest. A surprisingly quiet day with the only unusual sighting being a flock of 36 pink-footed geese at Greenwall. 2 mealy redpolls were at Kirbest with another along the west side, a robin and a chiffchaff were at the Obs with another chiffchaff, a goldcrest and a blackcap at Holland. Only 15 wheatears were logged and the glaucous gull remains in Nouster Bay. A collection of finches at Nether Linnay included 2 chaffinch, 2 mealy redpoll and a brambling, with a collared dove and kestrel also there. 6 chiffchaff, a blackcap and 2 goldcrest were in the south of the island and 6 common scoter flew past Tor Ness. 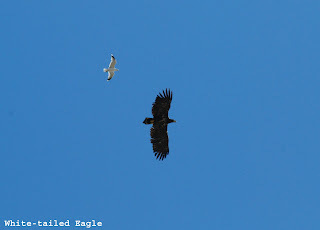 The immature white-tailed eagle was still present to 10:45 before circling high and heading to Fair Isle. Still reasonably quiet otherwise with 6 chiffchaff, 1 goldcrest, robin, 2 swallow, chaffinch and siskin. Also whizzing about the island were singles of rook, carrion crow, collared dove, stock dove and woodpigeon. 4 sandwich terns and a glaucous gull were in Nouster Bay. 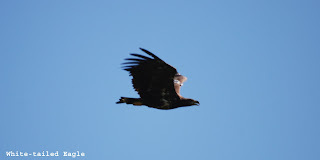 The morning produced similarly small numbers of common migrants as recent days, with a collared dove, 4 woodpigeon, a chaffinch and 4 goldcrest at Holland, plus 3 willow warbler and 5 chiffchaff elsewhere, but the day became much more exciting when an immature white-tailed eagle appeared over Hooking. 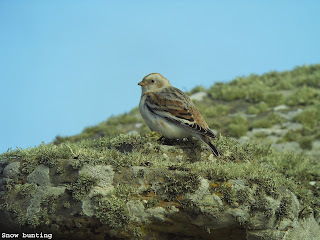 The bird toured the island during the early afternoon, and fitted with both a transmitter and wing tags is surely from the re-introduction scheme in East Scotland (white tags on both wings with what looks like the number 7 on each). Other migrants today included 2 rooks, 6 sandwich tern, 34 fieldfare, 19 wheatear, a robin and a swallow. A smart male mealy redpoll was with linnets at Nether Linnay, and a black redstart was at nearby Shooting Gallery. 2 black-tailed godwit were at Bewan, a robin, dunnock and blackcap at Westness and other migrants consisted 22 wheatear, a swallow, 3 chiffchaff and 3 goldcrest. Holland gardens appeared to be the only place with any migrants, holding a blackcap, 2 chiffchaff and 4 goldcrest. Only 2 wheatear were seen, 18 fieldfare were at Greenwall, singles of rook, jackdaw and carrion crow flew over and a glaucous gull was in Nouster Bay. 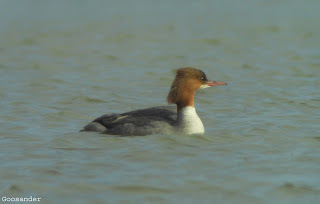 There was a surprise in the afternoon however, when 2 avocets dropped onto Gretchen Loch. These represent only the 4th island record involving 6 birds, though 3 of those have occurred since spring 2008. 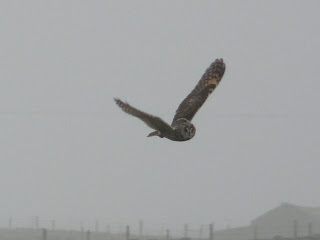 A frustratingly wet day with few birds and far too much rain! Of interest were a willow warbler at Tor Ness, chiffchaff, collared dove, woodpigeon and sparrowhawk in Holland, 2 glaucous gulls and a common scoter. 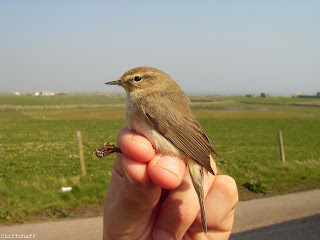 A hawfinch and the earliest Orkney record of grasshopper warbler were today's highlights, with also the first blackcap, dunnock and 2 white wagtails of the spring. Chiffchaffs were seen at Greenwall and Shooting Gallery, a male stonechat was at Cruiserbreck and a redpoll sp. flew over Westness. Other migrants included 2 goldcrest, 35 wheatear, 4 song thrush, 2 robin, and the woodpigeon and sparrowhawk remain. The springs first sparrowhawk was in Holland early morning, and 38 curlew flew through north in small groups. A sandwich tern was in Nouster Bay as were 2 glaucous gulls, and the woodpigeon was still present at the Surgery. 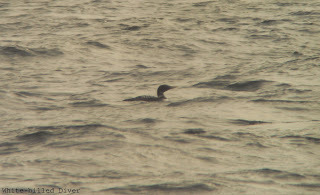 There was a fair scattering of wheatears with 24, plus 2 goldcrest, a jackdaw and a robin, but the afternoon certainly had more quality with an immature white-billed diver off the north end, and the relocation of the ring-necked duck, now alone on Trollavatn Loch. Whilst watching the diver a bonxie and a manx shearwater passed by at sea, a grey plover flew over and notable on a local scale, 2 stock dove bottled the flight to Fair Isle. A pretty awful day in terms of weather with persistent heavy rain making birding awkward. The only new arrival was a carrion crow at the Airfield, the long-eared owl was still at Holland and 2 sandwich terns were in Linklet Bay. Only 2 wheatears were seen, the pink-footed goose was still by Kirbest and just 1 glaucous gull was in Nouster Bay. A long-eared owl was flushed from Holland early morning and thrushes were much more evident with 42 blackbirds, 32 fieldfare, 13 redwing and 2 song thrush. A goldcrest was at the Surgery, the siskin and woodpigeon remain and wheatears tallied up to a notable 38 considering the early date. Also much more abundant were meadow pipit with 224, the first great skua passed the north end and a littoralis rock pipit was by Bewan. 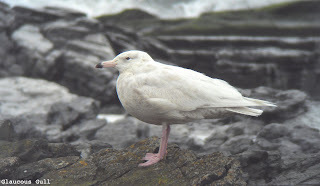 Other birds of note were a woodcock at Twingness, 2 robin and still 2 glaucous gulls in Nouster Bay. A few more migrants about today despite the lingering fog, most notably wheatears which had increased to 16 and the first chiffchaff at Holland. A siskin and a woodpigeon were at Westness and a woodcock, robin and song thrush were seen along the west side. 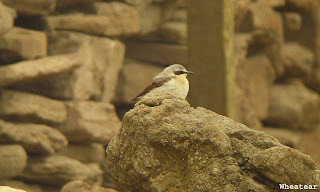 The first swallow flew through today, a goldcrest was at Holland and at least 4 wheatear present. The glaucous gull is still feeding on the dead dolphin in Nouster Bay where there were 10 red-breasted merganser, and 2 chaffinch were seen. Towards the evening curlew started to trickle north with 31 passing through, and the golden plover flock is slowly increasing with 230 today. A much nicer day and a handful migrants to show for it. The female ring-necked duck was still on Garso Loch, wheatears had increased to 4 and a small movement of corvids included at least 9 hooded crow, 7 rook and 2 jackdaw. 3 sandwich terns were seen offshore at Bridesness, a song thrush was in Holland gardens and a goldcrest was at Rue. The wheatear and chaffinch remain by the pier, and single rook and sandwich tern are new for the year. 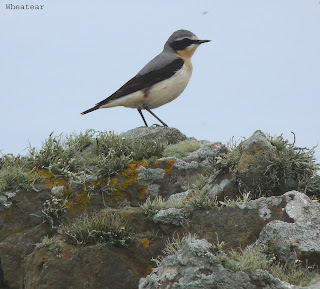 61 skylark were at Kirbest and a littoralis rock pipit was seen at the north of the island.